In response to God’s revelation, Mennonite Brethren have declared our shared convictions in our Confession of Faith—defining who we are as Mennonite Brethren in Canada. Convictions are not simply beliefs, but our core commitments that must be lived out for us to claim they are our convictions. These convictions set forth a vision for what it means to live as faithful disciples of Jesus and are a witness to the transforming gospel of Jesus Christ. How does the MB Confession of Faith function within the life of the church? Scripture, as we are guided by the Holy Spirit. 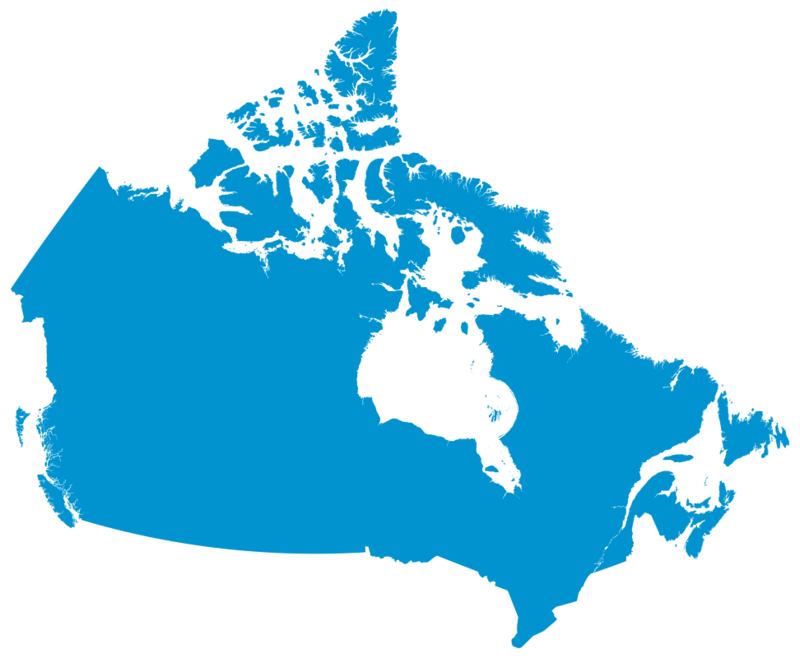 Describe what Canadian Mennonite Brethren believe the Bible teaches. Provide an interpretive guide for understanding and applying Scripture. Focus the teaching and preaching ministry to strengthen and lead the church. Define corporate MB theological identity. Apply the teaching of the Bible to the relevant issues facing the church. Describes what kind of people Mennonite Brethren are to be as we seek to follow Jesus. Calls the Mennonite Brethren church to live out our convictions by integrating theology and practice. Shapes and leads worship within local congregations. Introduces new believers to the teaching of Scripture. Calls new church leaders and emerging churches to join a covenant community. Forges unity through a consensus regarding how to interpret what the Bible teaches. Provides a normative guide for scriptural discipline. Clarifies that Christian faith is a seamless garment of believing, belonging, and behaving (i.e., knowing, trusting, and acting). Testifies to God’s reconciling and transforming work through Jesus Christ by the power of his Spirit. Offers a peaceable, missional proclamation and demonstration but the church of Jesus’ life, death, resurrection, and reign – a testimony grounded in our common theological convictions. Lays a foundation for our networks and mission partnerships with other Christian groups. 1. Why do we choose a Confession of Faith approach rather than a doctrinal statement of belief? The Confession of Faith is more than a doctrinal statement of belief in that it represents the shared convictions of a community expressed as a lived theology, which defines our common identity. The confession is not simply a set of doctrinal beliefs to which we give assent. Rather, it is our core convictions—our commitments—that we seek to live out in our lives, our service, and our witness. This is important because our convictions reflect what we believe, how we live, and what we teach. The Mennonite Brethren Confession of Faith describes a shared understanding of the teaching of Scripture which we have discerned and publicly confessed together as a community. As such, the confession is descriptive—not like the results of a survey describing what the majority of Mennonite Brethren might believe—but rather descriptive of what Mennonite Brethren together understand the Bible to teach. Our confession points beyond itself to the Bible and is authoritative to the extent that it is biblical. 2. How does the Confession of Faith serve as a basis for MB identity? Christians’ primary identity is in Christ, who was sent by the Father to deliver, heal, redeem, and restore the world through His atoning death, resurrection, and ascension to the right hand of the Father. It is God’s purpose to create for Himself a people. To be “in Christ” means we have been baptized into one body, His church, by His Spirit. Our identity in Christ as His disciples must be lived out in the context of a local church, which is a part of the larger people of God. Mennonite Brethren identity as a family of churches arises from three intertwined characteristics: shared convictions, shared relationships, and shared mission. The Confession of Faith articulates Mennonite Brethren core convictions, which express our commitment to hold to and live out the teaching of Scripture as we understand it. If Mennonite Brethren change our convictions, we become a different community than we were before. While there are diverse theological perspectives and congregational practices within the Mennonite Brethren family, the confession represents our endeavour to express the core set of convictions we all share. While the confession does not attempt to define a rigid set of beliefs or enforce a uniform practice within every church, it does function as a mutually agreed upon statement regarding what it means to be Mennonite Brethren. 3. What role does community hermeneutics play in developing the Confession of Faith? Community hermeneutics describes the church gathering around Scripture to listen to the Spirit. “We practice a corporate hermeneutic, which listens to the concerns of individuals and churches, but discerns together the meaning and intent of the Scriptures.” Mennonite Brethren believe the same Spirit who inspired the Bible also guides the community of faith in the interpretation of Scripture. Our conviction that the Bible is the “authoritative guide in life and practice” moves beyond a formal statement to a transformational reality when there is consensus within the community regarding how to interpret the Bible. Simply asserting the authority of the Bible does not resolve interpretive questions because all readings require interpretation. Rather, as the church engages in a process of study and discernment, this creates space for the Spirit to guide the church toward a shared interpretation of the Word and agreement on how to live it out. The practice of community hermeneutics is based in the New Testament—particularly Jesus’ teaching about “binding and loosing” (Matthew 18:18)—language used by Jewish rabbis when interpreting the law to decide whether certain behaviours were either forbidden (bound) or permitted (loosed). Jesus recognized the church would also be engaged in a process of discerning how to apply Scripture when it encountered new issues within the various contexts in which it would find itself. Jesus’ presence among believers enables us to agree together, that is, to speak with “one voice” (Matthew 18:19-20) as we seek to discern God’s will. Paul’s instructions to the gathered church—“let two or three prophets speak and let the others weigh what is said” (1 Corinthians 14:29)—encourage all to participate but also recognize that what is said needs to be discerned or tested by the community. Early Anabaptists called these two references the “Rule of Christ” and the “Rule of Paul.” The model of the Jerusalem Conference, where the church gathered together to discern how the gospel is received by Gentiles (Acts 15), provides a concrete example of how to listen to the Word and the Spirit in the face of disagreement and conflict. This was neither a democratic process favouring the majority, nor a forced harmonizing of all opinions. The Spirit of God speaks to the church through the Word of God; and the example of the early church portrays believers who are active, not passive, listeners. Their example calls for the participation of the community in studying Scripture together in order to discern what God is saying. Leaders facilitate listening to the Word, listening to each other, as well as a healthy decision-making process. Depending on the issue, this can happen in local congregations, or at the levels of provincial and national conferences. The involvement of the community in discerning the meaning and significance of Scripture challenges tendencies to view Bible reading primarily as an individual or private experience, which can often lead to personal interpretations. 4. Why do Mennonite Brethren revise their Confession of Faith? As the church continues to wrestle with our understanding of Scripture in the context of a changing world, we are challenged to understand and faithfully live out Scripture, which may require changes in the church’s relationships and conduct. However, any changes must be made in uncompromising obedience to the Word and Spirit of God. Since the Confession of Faith is descriptive, it is not a closed statement but open to periodic review and revision. (This happened during the 1970s and again in the 1990s.) Reasons for revising the confession have included the desire to make it more accessible and understandable, develop greater consensus among churches, and address new issues or questions facing the church. Mennonite Brethren recognize that at no time in history has the church’s understanding of God’s Word and His will been total or complete. As the church experiences new or changing situations and relationships in the world in which we live and witness, we must seek the Spirit’s guidance through the study of God’s Word. 5. In what way is the Confession of Faith authoritative? The Confession of Faith is understood to be normative for Mennonite Brethren churches because it expresses what Mennonite Brethren believe the Bible teaches and what faithfulness to the gospel entails. The idea of being “normative” highlights how a conviction or statement in the confession reflects a faithful reading or interpretation of Scripture. Thus, the confession is binding for all Mennonite Brethren churches—pastors, teachers, and conference leaders are expected to affirm and teach the confession. 6. What happens when a church moves away from the Confession of Faith? Departure from the confession has always been understood to be a violation of covenant relationships. In a 1987 resolution, Mennonite Brethren affirmed that pastors, teachers, and churches are not at liberty “to disregard or teach convictions that are not in agreement with our Confession of Faith.” At that time, the Board of Faith and Life also recognized that there may be times when leaders embrace a “principled confessional integrity” rather than a “legalistic confessional rigidity.” In other words, struggles with particular statements in the confession are not incompatible with affirming the confession in principle. However, churches and church leaders who neglect, passively dismiss, or intentionally choose to stand over against the confession invite a process that includes conversation, exhortation, and potentially, discipline. 7. Are all articles in the Confession of Faith equally important? Mennonite Brethren have rejected the development of a two-tier confession that differentiates between “essentials” and “non-essentials.” Nevertheless, some of the 18 articles in the Confession of Faith may be more significant than others (compare “Salvation” and “Stewardship”) and other articles address issues that flow out of previous articles (see “Creation and Humanity” and “The Sanctity of Human Life”). However, each article expresses Mennonite Brethren understanding regarding what the Bible says about a particular topic. There is much about the Christian faith and practice that is not included in the Confession of Faith, where Mennonite Brethren recognize differing interpretations and perspectives. The nature of our confession is that it expresses the core shared convictions held by Mennonite Brethren; therefore, inclusion in the confession is already a declaration of what we understand to be essential. A two-tiered approach would give the impression that biblical teaching on certain topics is not really worth maintaining because it is deemed to be a non-essential. Furthermore, the distinction between “essential” and “non-essential” has often been drawn between what one believes and how one lives—the very connection that is at the heart of Mennonite Brethren identity. 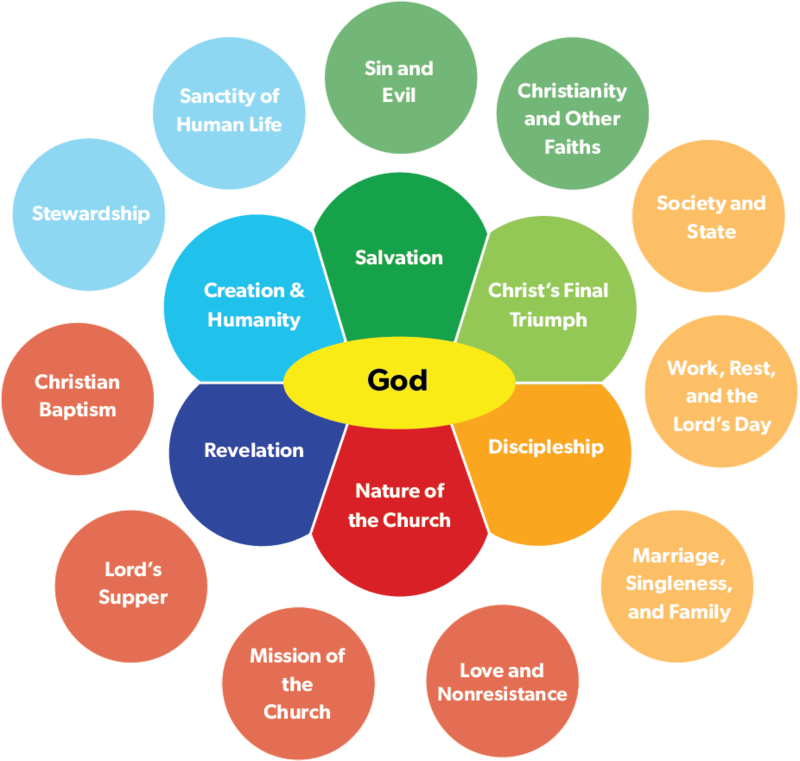 The diagram below illustrates some of the ways in which the articles of the Confession of Faith are integrally related to each other—these relationships are not based on what is essential or non-essential. The triune God is at the heart of everything, surrounded by central affirmations of our faith that arise from our understanding of God, as revealed in Scripture. The outer circles reflect convictions that describe practices and engage questions emerging from our experience in the world. 8. What is the purpose of an MB Confession of Faith in light of the mission of the church in Canada? Wouldn’t a more generic evangelical and even doctrinally oriented statement do more to promote unity with other Christian churches? There are no generic Christians, only particular Christians. To ignore any Christian group’s particular emphases risks ignoring the Holy Spirit’s specific work within that group. Growth into the unity of the Spirit and the mature character of Christ takes place when we recognize the shared and particular convictions of each Christian denomination and tradition. The Mennonite Brethren Confession of Faith represents the shared convictions of a particular community—a family of churches—that live in relationship with one another as a concrete expression of what it means to be part of the people of God. Mennonite Brethren identity emerges out of the shared journey of a community of disciples who are called to participate in God’s mission together. Mennonite Brethren continually welcome new members to the family, in which Canada is one of over 20 national Mennonite Brethren conferences. As a family of churches, Mennonite Brethren have a long history of fellowshipping and partnering in mission with different churches and denominations. While we share many of the same convictions held by other Christian believers, the assumption that unity can only be achieved when believers assent to a select (or generic) set of doctrinal beliefs is mistaken. Our confession enables others to know who we are as a family of churches, which therefore enhances rather than hinders our ability to build relationships and partner together in proclaiming the good news of the Kingdom of God. Confession of Faith: Commentary and Pastoral Application. Board of Faith and Life. Winnipeg: Kindred Productions, 2000. “Consensus and Change in Respect to Ethical Issues.” Yearbook: General Conference of Mennonite Brethren Churches, 51st Session, 11-12. Winnipeg: Christian Press, 1969. Heidebrecht, Doug. “Confessing Our Faith: The Significance of the Confession of Faith in the Life of the Mennonite Brethren Church.” In Renewing Identity and Mission: Mennonite Brethren Reflections after 150 Years, edited by Abe J. Dueck, Bruce L. Guenther, and Doug Heidebrecht, 141-153. Winnipeg: Kindred Productions, 2011. Heidebrecht, Doug. “Gathering around the Word to Listen to the Spirit: Community Hermeneutics Explained.” Mennonite Brethren Herald, May 2011, 8-9. “The Individual Member and Guidelines of the Church.” Yearbook: General Conference of Mennonite Brethren Churches, 60th Session, 13. Winnipeg: Christian Press, 1969. “Resolution on Confession of Faith.” 1987 Yearbook, General Conference of Mennonite Brethren Churches. Abbotsford, August 7-11, 1987, 68-69. Toews, John E. “The Meaning of the Confession.” Mennonite Brethren Herald, October 28, 1988, 6-7. Toews, John E. “Reflections on Issues Re the Confession of Faith.” Position Paper for General Conference BORAC. April 25, 1988. A220, BORAC Box 5, ML&A, Fresno. 1987 Yearbook, General Conference of Mennonite Brethren Churches (Abbotsford, August 7-11, 1987), 67. “Resolution on Confession of Faith,” 1987 Yearbook, General Conference of Mennonite Brethren Churches (Abbotsford, August 7-11, 1987), 68. John E. Toews, “The Meaning of the Confession,” Mennonite Brethren Herald, October 28, 1988, 7. This wording is adapted from Doug Heidebrecht, “Gathering around the Word to Listen to the Spirit: Community Hermeneutics Explained,” Mennonite Brethren Herald, May 2011, 8-9. “Resolution on Confession of Faith,” 69. “Article 2: Revelation of God,” MB Confession of Faith. John E. Toews, “Reflections on Issues Re the Confession of Faith,” Position Paper for General Conference BORAC. April 25, 1988, A220, BORAC Box 5, ML&A, Fresno, 7-8; and “Article 2: Revelation of God.”. “Resolution on Confession of Faith,” 68. This wording has been adapted from “Consensus and Change in Respect to Ethical Issues.” Yearbook: General Conference of Mennonite Brethren Churches, 51st Session (Winnipeg: Christian Press, 1969), 11-12. See also “The Individual Member and Guidelines of the Church.” Yearbook: General Conference of Mennonite Brethren Churches, 60th Session (Winnipeg: Christian Press, 1969), 13. Toews, “The Meaning of the Confession,” 7. 1987 Yearbook, General Conference of Mennonite Brethren Churches (Abbotsford, August 7-11, 1987), 72. At a 1988 study conference, Mennonite Brethren rejected the creation of a two-tiered Confession of Faith and affirmed a unified approach. See Report of the Findings Committee, Board of Reference and Counsel Study Conference (Calgary, April 27-29, 1988), 1, CMBS (Winnipeg). Doug Heidebrecht, “Confessing Our Faith: The Significance of the Confession of Faith in the Life of the Mennonite Brethren Church,” in Renewing Identity and Mission: Mennonite Brethren Reflections after 150 Years, edited by Abe J. Dueck, Bruce L. Guenther, and Doug Heidebrecht (Winnipeg: Kindred Productions, 2011), 147.